Cutaneous hypersensitivity to metal is not uncommon, affecting about 10-15% of the population. ,,, Dermal contact with metals and ingestion of metals have been reported to cause immune reactions, which may manifest as erythema, itchy papulovesicular eruptions, hives, etc. ,,,,, Metals known to be sensitizers (haptenic moieties in antigens) include beryllium, nickel, ,,, cobalt  and chromium. Hypersensitivity to tantalum,  titanium , and vanadium  has been reported only rarely. When patients with hypersensitivity to metals present for surgery where metallic prostheses are required, problems arise about the choice of the prosthesis. We present a case of a patient with proven metal sensitivity to cobalt, chromium, nickel and molybdenum, who required bilateral total knee replacement for osteoarthritis and was successfully managed by a titanium prosthesis. A Caucasian lady aged 65 years, with severe osteoarthritis in both the knees requiring bilateral total knee replacement presented at our institution for receiving the bilateral knee prosthesis. The patient had previous history of allergic reaction to metal buttons in her garments, wrist watch, and metallic jewellery. She also had persistent wound discharge after ankle surgery following a fracture of the ankle a decade ago. The fracture site had earlier been fixed using plates made up of stainless steel (cobalt, chromium and nickel). Following this surgery, the persistent operative wound discharge led to the removal of the prosthesis. Subsequently, testing for allergy to metals was performed by the MELISA® test, which is a blood test to measure Type-IV delayed hypersensitivity reaction (by lymphocyte transformation) to the conventionally used metals such as nickel, chromium, cobalt and molybdenum. The MELISA test in the patient revealed strongly positive allergy to nickel and chromium and weakly positive results for cobalt and molybdenum. Based on the MELISA report, the implant to be used in our patient was chosen to be of titanium (femoral and tibia component) and a polyethylene insert was used to avoid the possible metal allergy. 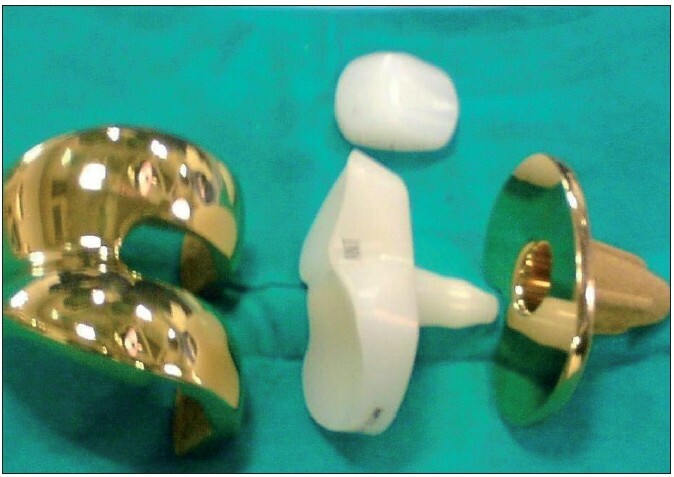 Since the commonly used prostheses are made up of cobalt, a completely titanium LCS total knee prosthesis (Depuy® ) had to be specially procured [Figure 1] for the patient. Bilateral total knee replacement was performed in two surgeries staggered over 4 days. The patient was discharged a week later without any problems. The case demonstrates the importance of metal allergy in patients undergoing metal prosthetic surgery. All metals in contact with biological systems undergo corrosion. This electrochemical process leads to the formation of metal ions, which may activate the immune system. If cutaneous signs of an allergic response appear after the implantation of a metal device, metal sensitivity should be considered. In the absence of signs and symptoms mentioned above, as in our patient, nonhealing of a postoperative wound in the absence of infection should raise doubts of metal allergy. The testing for delayed-type hypersensitivity for such patients can be conducted either in vivo by skin testing (patch testing or intradermal testing) or in vitro by lymphocyte transformation testing and leukocyte migration inhibition testing using the patient's blood. Titanium appears to offer the least allergic profile in comparison to other metals and was therefore chosen in our patient. The impurities in titanium might induce allergies at times, although rare. Our case demonstrated the need for proper investigation with tests such as MELISA and also the need for proper history in all such patients. 1. Basketter DA, Briatico-Vangosa G, Kaestner W, Lally C, Bontinck WJ. Nickel, cobalt and chromium in consumer products: A role in allergic contact dermatitis?. Contact Dermatitis 1993;28:15-25. 2. Cramers M, Lucht U. Metal sensitivity in patients treated for tibial fractures with plates of stainless steel. Acta Orthop Scand 1977;48:245-9. 3. Gawkrodger DJ. Nickel sensitivity and the implantation of orthopaedic prostheses. Contact Dermatitis 1993;28:257-9. 4. Merritt K, Rodrigo JJ. Immune response to synthetic materials: Sensitization of patients receiving orthopaedic implants. Clin Orthop 1996;326:71-9. 5. Haudrechy P, Foussereau J, Mantout B, Baroux B. Nickel release from nickel-plated metals and stainless steels. Contact Dermatitis 1994;31:249-55. 6. Kanerva L, Sipilainen-Malm T, Estlander T, Zitting A, Jolanki R, Tarvainen K. Nickel release from metals, and a case of allergic contact dermatitis from stainless steel. Contact Dermatitis 1994;31:299-303. 7. Black J. Orthopaedic biomaterials in research and practice. New York: Churchill Livingstone; 1988. 8. Jacobs JJ, Skipor AK, Black J, Manion L, Urban RM, Galante JO. Metal release in patients with loose titanium alloy total hip replacements. Transactions of the Fourth World Biomaterials Congress. Berlin: European Society for Biomaterials; 1992. p. 266. 9. Jacobs JJ, Skipor AK, Urban RM, Black J, Manion LM, Starr A, et al. Systemic distribution of metal degradation products from titanium alloy total hip replacements: An autopsy study. Trans Orthop Res Soc 1994:19:838. 10. Black J. Systemic effects of biomaterials. Biomaterials 1984;5:11-8. 11. Liden C, Wahlberg JE. Cross-reactivity to metal compounds studied in guinea pigs induced with chromate or cobalt. Acta Derm Venereol 1994;74:341-3. 12. Angle CR. Organ-specific therapeutic intervention. In: Goyer RA, Klaasen CD, Waalkes MP, editors. Metal toxicology. San Diego: Academic Press; 1995. p. 71-110. 13. Lalor PA, Revell PA, Gray AB, Wright S, Railton GT, Freeman MA. Sensitivity to titanium: A cause of implant failure. J Bone Joint Surg Br 1991;73:25-8. 14. Parker AW, Drez D Jr, Jacobs JJ. Titanium dermatitis after failure of a metal-backed patellas. Am J Knee Surg 1993;6:129-31. 15. Hallab N, Merritt K, Jacobs JJ. Metal sensitivity in patients with orthopaedic implants. J Bone Joint Surg Am 2001;83:428-36.